Nine authors, including national bestsellers and award-winners, bring an array of prose that is sure to provide a delicious literary experience. 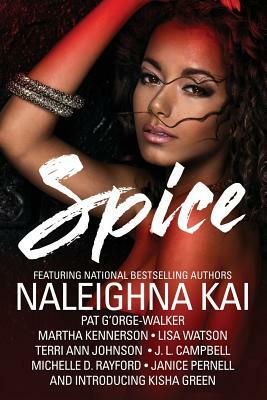 Naleighna Kai, Lisa Watson, Pat G’Orge Walker, Martha Kennerson, Michelle D. Rayford, Janice Pernell, J. L. Campbell, Kisha Green, and Terri Ann Johnson have crafted stories in a range of genres from contemporary fiction, women’s fiction, romance, erotica, and even a thriller to give you a taste of the most anticipated fiction offerings of the year.We hope you’ll find this anthology is an eclectic blend that will stay with you long after the pages have been turned. But it doesn’t have to end here. Take a walk on the sweet side in the accompanying anthology, Sugar featuring New York Times bestselling author S. L. Jennings and other national bestsellers such as J. D. Mason, Shakir Rashaan, London St. Charles and Naleighna Kai. Tell us what do you think about Spice.